Westonbirt School is an Independent Boarding and Day School for girls aged 11-18 in the heart of the English countryside. 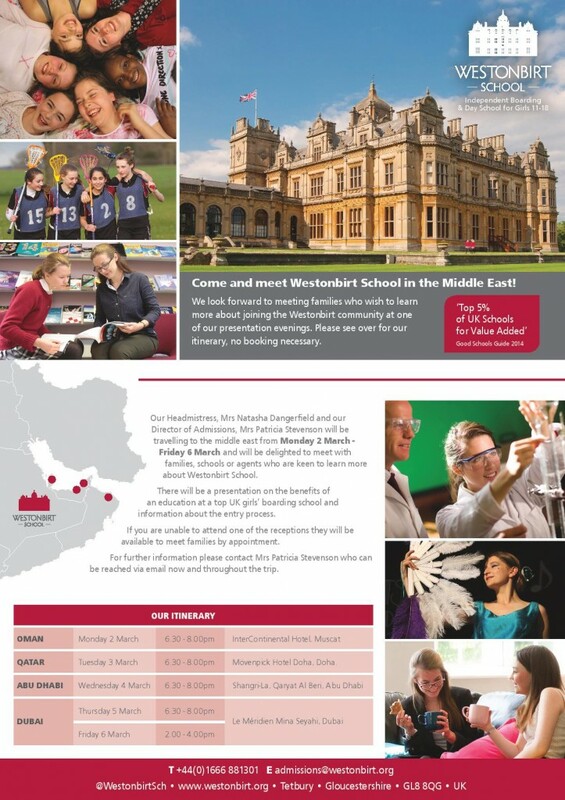 Their Headmistress, Mrs Natasha Dangerfield and their Director of Admissions, Mrs Patricia Stevenson will be travelling to the Middle East from Monday 2 March – Friday 6 March and will be delighted to meet with families, schools or agents who are keen to learn more about Westonbirt School. There will be a presentation on the benefits of an education at a top UK girls’ boarding school and information about the entry process. If you are unable to attend one of the receptions they will be available to meet families by appointment. For further information please contact Mrs Patricia Stevenson who can be reached via email now and throughout the trip.